Crime Watch: More 'Kiwi' crime to hit local shelves! More 'Kiwi' crime to hit local shelves! After a good year in 2009 for Kiwi crime, thriller and mystery fiction, in which at least a dozen new novels were released by New Zealand citizens or residents, here and overseas - and many by major publishers, some even in multipile countries - 2010 is already showing a nice continuation of that pleasing trend, with more positive signs for the growth of New Zealand crime writing (and appreciation of that crime writing) in future. Already we have seen novels by Vanda Symon, Paddy Richardson, and Paul Cleave hit the local bestsellers lists in 2010 (previously quite a rare occurrence for NZ crime writers), with Richardson's HUNTING BLIND even scooping the #1 spot. Hopefully this is a sign New Zealand readers, who buy international crime and thriller titles in droves, are slowly starting to realise that many of our own authors are also pretty damned good. We can hope. There also seem to have been more reviews by major media of such local crime writing - and crime and thriller writing has also been in the positive spotlight lately with the enthusiastic packed-out crowds for Lee Child event in several cities. I understand there are some other great international crime writers who are also visiting our shores later this year, so hopefully that enthusiasm and positivity around crime and thriller writing will continue. There are also some other things in the works that could help raise the profile of New Zealand crime writing even more - I will keep you informed as things are officially announced. And now another new release from another top quality New Zealand-based writer is about to hit our shelves; CAPTURED by Neil Cross - which is released down this end of the world in just over a week. Already published in the UK earlier this year, CAPTURED features Kenny, a terminally ill young man who wants to find his childhood friend Callie Barton and thank her for her past kindness, before he dies. I really enjoyed Neil Cross's most recent dark and twisted thriller, BURIAL, last year (you can read my review of that novel for EuroCrime, here), so I am looking forward to getting my hands on a copy of CAPTURED. It's been a good year already for Cross, the Wellington-based crime novelist and TV screenwriter, with him stealing the show at the Gala Opening of the New Zealand Arts Festival's Writers and Readers Week, his new TV series Luther looking very promising, the launch of his fantastic new website, and CAPTURED receiving some very good and great reviews in his native Britain, where it was released earlier this year. In The Guardian, John O'Connell said, "Cross is a wonderful writer, full of mordant psychological insights. We may lose him to television – he was lead writer on the last series of Spooks – unless we wake up and recognise him for what he is: Britain's own Stephen King." 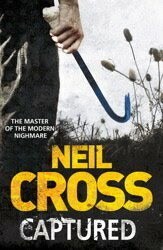 The Daily Mirror said, "‘Once again, Neil Cross proves that he’s not just a master of suspense, but horror too. Reading his ultra-crisp prose and expertly structured tales, it’s not hard to see why he’s also an uber-successful screenwriter." Maxine Clarke called CAPTURED "an intense, rather depressing read but undoubtedly powerful and imaginative" at EuroCrime. You can read the first chapter of CAPTURED here, and decide for yourself. As an aside, there was also an interesting interview with Cross recently on the Murderati website - which consists of regular daily blog posts from crime writers acclaimed and new (including the likes of Alafair Burke, Alison Brennan, Brett Battles, Zoe Sharp, and Tess Gerritsen) - about the release of BURIAL, and Cross's TV shows, in the USA. You can read the interview here. So, have you already read CAPTURED (those of you in Europe)? Are you interested in reading it? What do you think of the first chapter? Of Cross's writing in general - either for TV shows or novels? Thoughts and comments welcome.